Time and attendance software automates the tracking of the time your employees work. It monitors hours worked, overtime, time taken off and leave balances—keeping you in compliance with labor laws and replacing outdated time cards and sheets. We compared several easy to use tools at a price small businesses can afford. Homebase (Best Overall) more features at the free level than many other options at their paid. When I Work Free scheduling tools and businesses that want workstation and location tracking (GPS). Workly High tech or manufacturing businesses that want to sync with a biometric time clock. Ximble Business like restaurants and retail that share employees across multiple locations and allow shift trading. Deputy Professional and service businesses that need to bill time to clients using invoices. Zoho People Business that want to full HR software in addition to time and attendance tools. TSheets Service industry and remote workers due to GPS, appointment scheduling and messaging options. To evaluate time and attendance software for small businesses, we looked at affordable options that would eliminate your need for time sheets or a time clock. We also evaluated options for a variety of business types like healthcare and restaurants (shift scheduling) and service industries (tracking time against jobs). Based on these options, and the fact that it’s free, we choose Homebase as the best time and attendance software for small business. It also interfaces with our top recommended small business payroll provider, Gusto, as well as ADP and its competitors. Homebase is best for any small business with only one location because it includes more features at the free level than many other options do in their paid plans. It provides free online time management tools and mobile apps for employees to clock in, and allows managers to monitor attendance. Homebase eliminates paper time sheets and improves scheduling and communication with team members. Their drag-and-drop interface makes shift swapping easy and their dashboard lets you see your team at a glance. Homebase provides scheduling tools in addition to its free time sheet and time clock. Homebase provides a mobile app, and is free forever if your company has one physical location or allows employees (such as service workers) to clock in through the mobile app. In addition, they provide online documentation to make using the free software easy. To access it, you’ll need to provide your name, business name, email address and zip code. No credit card is required, and you get all the timekeeping, attendance, scheduling, communication and reporting tools free. You can’t really get better than free. Homebase is free for one location and for an unlimited number of employees, making it perfect for brick-and-mortar businesses. They also have pricing tiers that range from $20 to $100 a month, adding features like GPS and multiple locations. A 20 percent discount applies if you pay annually. However, for the average startup or small business, their free plan truly does it all, including providing labor cost reports, at no charge. Some businesses may prefer to upgrade to the $99.95/month Enterprise plan that adds API access, auto-scheduling, forecasting, and dedicated account management. In addition to free software, Homebase provides a free 14-day trial on its paid plans. It doesn’t require a credit card to sign up, and lets you see first-hand which plan is best. Most time and attendance software charges based on the number of employees, from $1/month per employee to as much as $10/month per employee or more. Homebase doesn’t do this. Even if you opt for their paid Plus plan with tons of features, you’ll never pay more than $40 a month—even if you have hundreds of employees. That makes Homebase a great time and attendance platform for business that are growing and don’t want their software costs to go up each time they hire a new employee. 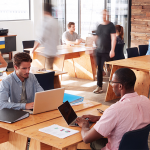 Of course, if you have only one physical location, you can use the free program for as many employees as you want. It’s unlimited. Homebase makes your life easier by providing a hiring feature free within their timekeeping software. 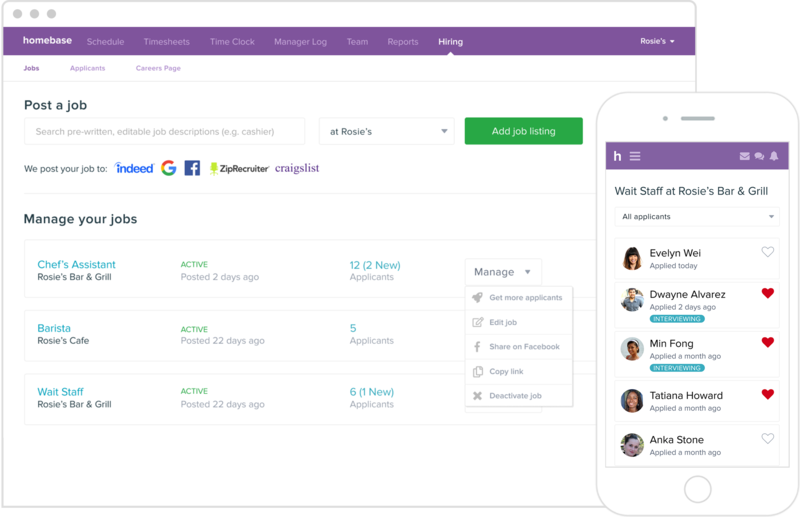 That helps you find employees to fill your schedule by posting jobs on job boards. You can add a job posting and recruit for new employees right from within Homebase! That’s a feature you won’t find in most time and attendance software. Homebase helps you fill your schedule by posting open jobs to find employees. One of the most difficult issues with scheduling, especially in an environment like a restaurant where shifts change and workers are part-time, is keeping your team members in the loop. Homebase solves that by providing a messaging app that lets you send messages to your entire team, or to a co-worker. This protects your workers by not showing their phone numbers. And, it lets your managers provide employees with additional information they might need to know about their job or work schedule. Homebase can be your one-stop shop for team scheduling and shift changes. Of course, you could also use the messaging app to improve your employment brand by thanking workers for a great job, or for taking on an extra shift. The time sheet and time clock features let your employees clock in from their phone or any mobile device. For example, you could have an iPad that employees could clock into instead of having to buy a time clock. Employees clock in using a PIN and you can even have a photo taken of the employee to eliminate buddy punching. And if an employee forgets to clock in? No problem. You can edit their time card on the fly. The system also tracks breaks, both paid and unpaid, so that you’re compliant with labor laws. In fact, even in the free version, you can track your labor costs! Homebase integrates with our top recommended payroll system, Gusto. It also integrates with Square (POS) and QuickBooks (Accounting), as well as ADP. By connecting Homebase to your POS system, you can import your employees and view your labor costs as a percentage of sales. However, if you want the API to sync the data with other systems, you will have to purchase the Enterprise package, which starts at $80/month if you sign up for an annual contract. Their support is available 24/7 online or by phone with a real human. That’s great if you’re running a retail or food service business and need help on the weekends. The mobile app does a lot, but it’s also a bit cluttered and may be hard for those who aren’t digital natives to figure out at first. Homebase is top-rated (five stars) on software review sites, including ours. People love that they can delegate shift scheduling and swaps to the employees themselves, as well as do job costing right from the app. For more insights, read our Homebase review. When I Work is best for businesses that want to track time based on employees being at their workstation or location. It was a close runner-up to Homebase because it’s also free. But unlike Homebase that’s free for an unlimited number of users, When I Work is only free if your business stays under 75 employees. The free version includes an online scheduler, free mobile apps and free team messaging—again, similar to Homebase. When I Work gives you the option to track workstations so that you can see if the worker is actually signed in at their workstation. It also has a GPS feature to track where employees are located when they clock-in or out. When I Work has an intuitive scheduling dashboard. With When I Work, you can set up an email account when you add employees, and they’ll get an invitation to sign into the mobile app. From the app, they can clock in, receive shift changes, schedule time off and communicate with their manager. And similar to Homebase, When I Work also integrates with Gusto, QuickBooks and ADP, saving you steps as you move your time card data to payroll. When I Work is priced starting at free and goes up to $1.75/month per user. With When I Work, the scheduling and employee attendance tracking is free for up to 75 users. You’d need that to keep track of employee time worked. However, When I Work is priced based on the number of employees, and is not unlimited like Homebase. For example, when you hire your 76th employee, you’ll automatically be upgraded to a paid plan. Advanced scheduling features cost $1.50 extra and include options like scheduling multiple teams and remote job sites as well as scheduling out into the future (10 days). When I Work offers a discount if you pay annually. Or, you can try their paid plans free for 30 days. Like Homebase, the free trial doesn’t require a credit card to sign up. When I work includes a schedule builder, access to your employee’s availability, and time off management for free. That includes shift trading. If you upgrade to a paid plan for only $1.50 per employee per month, you get all the timekeeping features, such as a time clock and attendance tracking, as well as reports that let you see a breakdown of hours worked within each pay period. It includes the exact time employees clocked in and out. In the free plan, you get one schedule. They also provide a free time clock app, so that your employees can clock in from their mobile devices, similar to Homebase. The GPS feature of When I Work is great if your business is in a service industry, or you want to make sure employees are onsite at the work location before they clock in. You can see exactly where the employee signed in from. Similar to Homebase, When I Work gives you a tool within the software to communicate with your employees. You can send them an email or text message if you’ve input that information into the system for each team member. The employee scheduling features are the highlight of When I Work, since you can create and publish the schedule, fill time slots for open shifts, approve time off and monitor your entire schedule at one time. When you add the Attendance feature, you will be able to see the difference between when employees were scheduled versus what hours they actually worked. Employees can get their schedules, view messages and clock in/out on their smartphone using iPhone and Android apps. When I Work provides support via website tickets, as well as email and online chat, seven days a week. It’s open Monday to Friday, from 7 a.m. to 10 p.m., and from 9 a.m. to 5 p.m. on the weekends. They also have a Customer Care team that works Monday to Friday, 7 a.m. to 7 p.m. All hours are Central Time. When I Work also hosts free live and recorded webinars to teach best practices for using their system. They provide training webinars for employees as well. This can help you get your team up to speed quickly. The free scheduling software only allows you to have one schedule, which may be a problem if different workers work different work schedules. For example, field workers may start at 7 a.m. versus office workers who start at 8:30 a.m. We also found When I Work to be a little less intuitive to set up than Homebase. When I Work has good ratings, only a wee bit lower than Homebase—more in the four- to five-star range on third-party review sites. Read our review to learn more about When I Work, where small business owners share their feedback. Workly is best for high tech or manufacturing businesses that may want to integrate their software with a biometric time clock. It’s also easy to use and allows employees to manage their own schedules. It integrates with your payroll system and provides mobile apps. Setting it up takes about 60 seconds as they walk you through the setup process online. 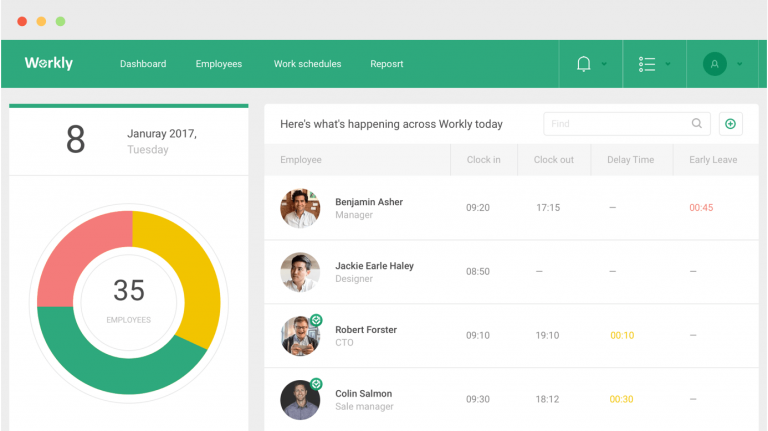 Workly provides an employee dashboard that lets you see what’s going on in your business at a glance, with color and photos that make using the software fun. And, they have many useful reports with data you can export. Workly provides a simple to use software tool. Workly is priced at $1.45 to $2.99 per employee, which makes it very affordable for a small business. The starter package is $29 for up to 20 employees, which averages to $1.45/month per employee. That is similar to what you’d pay with When I Work ($1.50/month per employee). Workly provides a free 14-day trial that doesn’t require a credit card. In addition, they offer their Timepad time and attendance application for free. Workly is easy to install and use, for both administrators and employees. It has all the basics that most small businesses would need—from time tracking to reporting. However, it doesn’t have the GPS features like Homebase or When I Work, and its mobile interface is more streamlined. Employees can also clock in from their cell phones, where you can audit to verify it’s them by looking at their photo. Or, you can sync it with a biometric time clock. Workly allows you to sync with a biometric time clock. You can use a tablet and download the free Workly Timepad app to track employee time and attendance using a PIN or QR code on a badge. Or, you can add any number of biometric time clocks if you want to ensure that the person punching in is the actual worker scheduled. Employees can view their schedules and request time off. Then, you can accept or deny their time off requests to give you control over your employees’ work schedule. The standard reports with Workly are amazing; they have reports by employee, department, or work schedule. They even offer salary reports, terminated employee reports, and employee headcount, to name a few. And, you can customize the reports in terms of what and who to include, exporting the report data to a CSV file for further analysis or to upload to other software systems. Workly provides support via online chat 24/7 with a live representative. They provide helpful how-to documents in their advice center. While the reporting great, there is no direct integration to other software. You’ll need to export the data from Workly in order to import it into other systems, such as HR/payroll software or your accounting system. It also doesn’t have messaging features like When I Work and Homebase. Third-party online review sites give Workly consistently high marks for its customer service, user interface, and affordable pricing. 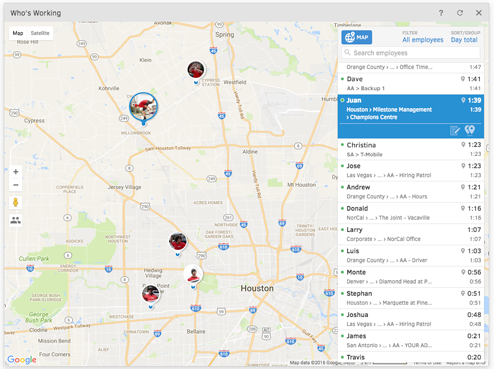 Ximble is a great tool for businesses in multiple locations that have to share employees, as you can see the employee availability and manage their time and attendance in one system. It also lets your employees manage their own scheduling, using drag-and-drop tools, including trading shifts, if needed. Ximble provides an easy drag-and-drop scheduling feature. Ximble, like Workly, has facial recognition (using a photo) and great options for software integration. With Ximble, the time tracking and scheduling features are priced separately. Costs range from $1 to $4/month per user. If you want both, prices start at $2/month per employee. However, they also tack on a monthly base fee of $15, which makes them more expensive that When I Work if you have just a few employees. To sign up, input your email address to start a free 14-day trial with no credit card required. That’s similar to most of the other time and attendance options we reviewed. Like Workly, Ximble also offers a 14-day free trial with no credit card required. That allows you to try out their system to see if you like it before you commit to a paid plan. Ximble offers the time and attendance features in their Time Tracking Solution that includes an easy way to review your employee time sheets. They support industries as diverse as cafes, healthcare, and veterinary clinics, as well as retail and food service. Ximble also gives you XimbleChat, which is their version of an employee messaging system similar to what’s offered by Homebase and When I Work. They provide a paid time-off policy that you can configure with your parameters. Their robust reporting includes time-off balances, as an example. Ximble also offers more integrations than some of the other time and attendance systems. In addition to Gusto and QuickBooks, for instance, you can integrate into BambooHR for your HR system, Xero accounting software or Lightspeed for your POS. That saves you from manually moving data from one system to another. When you add the scheduling for an extra $1, you’ll find their user interface easy to use and similar in look and feel to the other time and attendance tools we’ve reviewed. It also lets you see employee availability. Using the Ximble clock app, you can monitor your employees’ attendance, manage time sheets and limit the locations where your employees can clock in from. For example, you may want them to be able to clock in from your parking lot, but not from the mini-mart across the street. Employees can see their time sheet from the mobile app, so there’s no question whether they clocked in or not, and how many hours they worked. You can also download a free tablet app if you want workers to clock in onsite with facial recognition, a QR code or a PIN. These features are helpful if you want to avoid buddy punching or time theft (workers clocking in when they aren’t there). In addition to providing an easy scheduling tool, you can manage employee requests for schedule changes from the website or mobile app. You can also send reminders to employees, let employees know about open shifts you need filled, and push notifications to let your employees know when you change their schedule. That saves you time from making phone calls. Using Ximble you can manage shifts, but you can also delegate that task to your employees if you want them to find their own replacement. That takes the burden off of you to find a replacement if an employee wants to take time off on short notice. If you upgrade to the Enterprise package, you can get advanced reporting such as labor costing along with dedicated support and custom development. However, as a comparison, Homebase offers labor costing in their free package. If you need support with Ximble, your best bet is to fill out a request directly from the website or interact with their website chatbot, which can put you in touch with one of their Support Heroes (a real person) 24/7. Otherwise, they provide articles on the basic features such as how to set up your company and time clock approvals. They also provide an Employee Guide you can share with your staff. You have to upgrade to get HR, POS or Payroll integration. But the good news is they integrate with Gusto, Paychex and ADP, as well as Google and other software like QuickBooks and Xero (accounting) and Lightspeed (POS). Ximble users find it easy to use, but not always reliable. It receives ratings on par with When I Work, but not as high as Homebase or Workly. For more information, read our Ximble Review. Deputy is best for businesses that bill their clients for their time. It provides all the time tracking features a small business would need. That includes mobile time and attendance, facial recognition and dynamic reports. It serves all industries. But what makes Deputy stand out is generating invoices based on hours worked by customer, task or activity. Deputy user interface shows financial data in addition to staff schedules. Deputy can export work hours into accounting and payroll software so you can manage your billing and get paid. Further, it can allow you to input customized pay rates, per shift, job or in accordance with workplace agreements. Deputy costs $2/month per user for the scheduling. 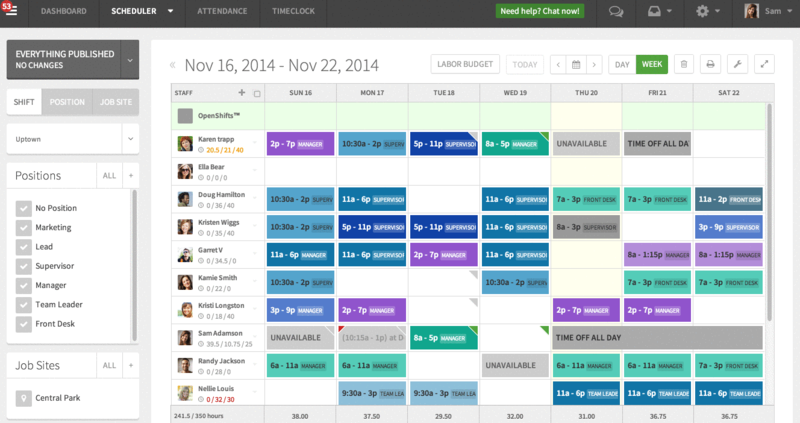 If you want Scheduling plus Time and Attendance, it’s $3/month per user. However, that’s about a buck more each month per person than some of the other time and attendance options we reviewed. They also offer an Enterprise plan that allows for customization and a dedicated support team, but you’ll have to contact them for a quote on that. You may be able to get a reduced rate with an annual plan. Deputy captures time and attendance and exports that data to your payroll system. They also have messaging features like Homebase and When I Work have, allowing you to communicate with your staff. In addition, they provide tools to make your work easier, such as auto-scheduling and leave management. Here are some of the features that make Deputy stand out. Using the auto-scheduling feature, Deputy will build a draft schedule for you in one-click. That way you don’t have to start from scratch. Instead, you can move boxes, people and change start and end times, without having to take the time to set up a schedule in the first place. News feeds are Deputy’s answer to team communication. 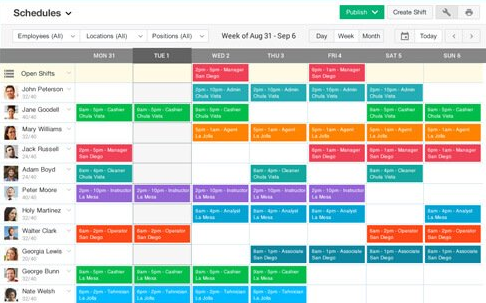 You can push schedules to your team via web, mobile or app. You can also delegate tasks. By using news feeds, you avoid having to send emails or texts to your staff. You can even set up messaging unique to employees working in a specific location. And when you post a message, your employees can chime in with their own comments. That improves team collaboration. Deputy screenshot showing time card approvals. If you bill time to clients, such as an attorney or a mobile glass repair service, then you’ll like how Deputy can track hours based on customer, activity or task. You can also allocate time across job codes or employees to create line item invoices for your clients. Deputy has more software integrations than any of the other small business time and attendance software we reviewed. It can share data with popular software for payroll, accounting, POS, CRM, HR, and others. That is helpful if you’re already using business software and want an easy way to keep all your systems in sync. Deputy provides support 24/7 via online chat. In addition, you can search for advice and answers using their help menu option. Deputy is feature-rich, making its interface a bit more cluttered than some of the simpler timekeeping software. Deputy gets high marks (mostly five stars) on third-party software review sites. Some users would like more features added to the app and others notice that the iPhone app has more features than the Android app. Zoho People is best for those who want a full Human Resources software system. You can use Zoho People to track hours worked, schedule and approve time off, manage leave balances and communicate with your employees. However, it does much more. On the attendance side, it provides geolocation. It can be customized and allows for web or mobile clock-in and out. Similar to Deputy, you can log billable and non-billable hours, schedule jobs and get reports. Zoho People is an HR system that includes time and attendance. And, as part of a full HR suite, it also allows you to build custom forms that you can use for HR purposes, such as gathering employee information. And it provides online performance reviews. That not only allows you to manage the time employees spend on the job, but also helps you determine how well they’re doing their job. Zoho has three pricing tiers that range from $1 to $3/month per employee. They offer an Enterprise version of their HR software for $5/month per employee that adds 360-feedback performance reviews, but provides no additional timekeeping features. If you pay annually, the price goes down slightly. For example, the $1 plan would go down to 83 cents per month. In addition, they have a free plan that provides a basic HR platform with no time and attendance features—if you have five or fewer employees. And they offer a 15-day trial so you can play around with the software before you choose which options you want. No credit card is required. 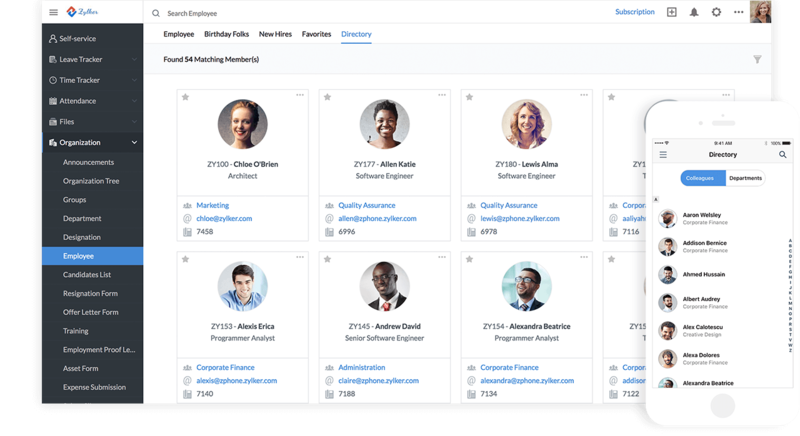 Because Zoho People is an HR platform, it includes an employee database and document storage as well as leave tracking. On the timekeeping side, it has attendance, biometric integrations, time tracking and shift scheduling (if you upgrade to the Premium package). You get timekeeping reports and have automation features, like email alerts and manager approvals. Like the other time and attendance tracking software we reviewed, it also has mobile apps. Leave tracking helps you keep track of employee time off. It’s provided at every tier of the software, including the free version of Zoho People. So if that’s the only time management feature you need, it’s not a bad option as you also get an HR database and can manage all your employee paperwork (including employee payroll documents and time sheets) online. 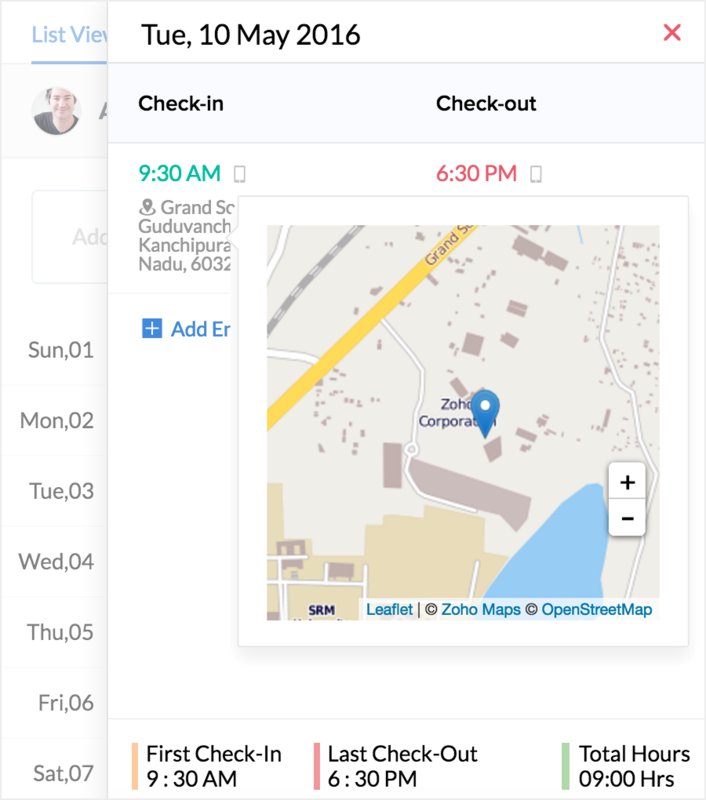 Attendance tracking lets employees clock-in and out via mobile or web. You can also integrate with a biometric time clock similar to Workly. If you have service workers, workers that report to a job site, or simply don’t want your employees clocking in until they’re inside the door, you can set up geolocation tracking. Geolocation lets you see where workers are located when they clock in or out. You can also use their API to track workers at their workstations, similar to When I Work. If you have workers who get paid both billable and non-billable hours, you can track that data within Zoho People as part of the time tracker. It also allows you to schedule customer jobs and work items and record those entries by week or month. If you have a business where employees need to fill out forms, such as tip reports or daily sales data, you can create those custom forms directly in Zoho People. In fact, you can have those forms do calculations for you, and then attach the completed form to your employee records. That’s one of the benefits of using time and attendance software that’s tied to an HR system. All your employee data, information, and documents will be stored in one place. Zoho People offers live chat to administrators, along with email and phone support for employees. In addition, when you sign up, you’ll get a few hours of free onboarding to help you set it up. Their online help is fabulous with user questions answered, step-by-step instructions, and screenshots. Zoho People is part of a huge suite of business software including sales, marketing, IT, help desk and custom solutions. If you sign up with Zoho People, you may well be encouraged to add on additional software modules over time. In addition, some of the functions, like capturing overtime, are a bit more difficult to set up and manage as Zoho isn’t U.S.-based. Zoho People has decent reviews on third-party review sites. They’re rated similar to When I Work. Because Zoho People is not based in the U.S., some users find it irritating in terms of non-standard date formats, spellings, and customizations. TSheets is best for businesses with offsite employees like service workers. 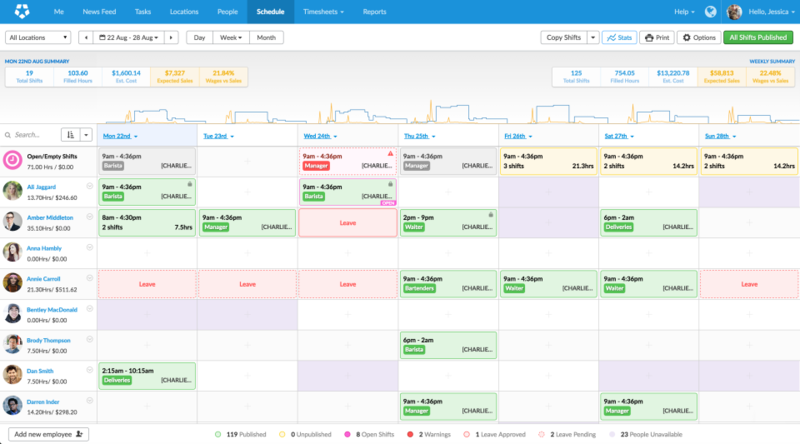 It lets you track employee hours against jobs and scheduled appointments. Like a few of the other software options, it also has GPS locations to verify service workers are on the job site before they clock in. 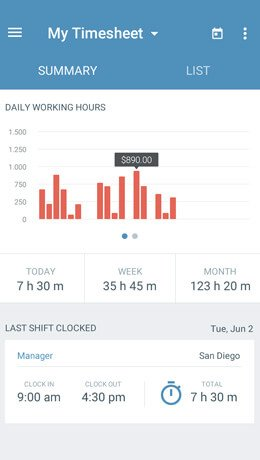 TSheets provides electronic time sheets and time cards that allow workers (even non-tech-savvy ones) input their time, see their appointment schedule and manage their PTO and vacation—right from their mobile phone. It’s great for remote workers who move from job site to job site, such as housekeepers or construction workers. It also provides workers with a reminder to clock in (or out) of each job. In addition, you can send field employees alerts and change their appointment schedules on the fly. If, for example, one customer cancels, you can send the worker an alert that they need to report to a different location. TSheets basic pricing is $5 to $6.25/month per employee, depending on the number of employees you have. They liken it to a cup of coffee per month per worker. Still, that’s more expensive than the other time and attendance software we reviewed. In addition, their paid plans have a monthly base fee that ranges from $20 to $100. That’s even higher than what Ximble charges. The main difference between the plans is the addition of the scheduling feature in the third plan, which provides a per employee discount once you get to 100 employees. It includes scheduling in the $5 price. However, at the time of this article, TSheets was having a half-price sale, which would bring their price right in line with the others. If you want to keep track of your own service work (self-employed), you can sign up for a one-user plan that’s free and add scheduling for only $1.25 a month. That lets you set up your own appointments in advance. In addition, TSheets offers a 14-day trial that requires no credit card. Employees can use whatever mobile device they have available, such as a laptop, tablet or mobile phone. They can even clock in over the phone by dialing in or via text message. And if the employee is on a job site out of range (no internet or mobile access), TSheets will keep track of the time entries and then sync automatically once service is again available. If you want facial recognition to eliminate buddy punching, you can set up a time clock kiosk that takes employees’ photos as they clock in. TSheets software integration options are as numerous as those offered by Deputy. They include QuickBooks Online & Desktop, Gusto, ADP, Square, and Xero, as well as other HR, payroll, expense tracking, and project management software tools. Service workers can manage individuals or crews with GPS locations linked to each person’s time sheet. As they change locations, the GPS keeps track of where they’re at, so you know who is working and where they are. It also shows map pins, so that you can see how long it takes and how far they’re traveling. You’ll know immediately if they’re lost or stopped somewhere for a snack. GPS time tracking shows employees locations on a map. Here’s where TSheets really shines for service workers and other remote/field staff. You can schedule by job or task, and easily see who is available for a last-minute or emergency call. You no longer have to provide a daily work schedule to team members whose work is based on appointments. Of course, it also works for shifts with drag-and-drop tools. Your employees will be notified once the work schedule is published, or whenever their shift is changed. It’s refreshing that TSheets provides their telephone support number right on their website. They are available seven days a week from 4 a.m. to midnight, MST. You can also reach them via email or chat. And, they provide online FAQs and user guides. TSheets is the highest priced of the options we reviewed (unless you happen to catch them during a 50 percent off sale). While it has alerts and approvals, it doesn’t have the collaborative messaging options like those available with Homebase and When I Work. TSheets isn’t rated as high as Homebase, but it’s on par with the other time and attendance software we compared. Because it is so feature-rich, some users find it takes time getting used to. Most reviewers found the customer service to be top notch. Timesheets Paper or electronic timesheets cost nothing but are labor intensive. Timeclock Wall mounted / electronic time clocks are good alternative for brick-and-mortar businesses. Scheduling Software Scheduling software works in appointment-based businesses, like professional services. Payroll Software If your labor force is mostly salary-based, payroll software like Gusto may suffice. PEO If you don’t want to manage time at all, consider working with a PEO or co-employer. Have a question about choosing the right time and attendance software for your business? Our analysts are standing by to answer! The best timekeeping and attendance tracking software is one that’s easy for you and your employees to use. It should make your payroll process easier as well. 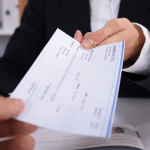 That means it can calculate overtime and move data to your payroll system, ensuring employees are paid in accordance with federal labor laws. For a low-cost payroll system that integrates with great timekeeping software, try signing up for Gusto. It integrates with most time and attendance software, including our recommend best, Homebase. The two connect to provide your small businesses with an integrated timekeeping, scheduling and payroll system that’s HR compliant and easy to manage. I’ve used TrackSmart to manage our employees’ time off for three years and love it! One of the main things I love about it is that our employees can go online and look at the calendar to see who is scheduled to be out on a certain day. It alleviates disagreements regarding who requested the day first, etc. TrackSmart has also given the employees the ability to look at the calendar away from the office, either online or on the app. They can request time off as soon as they decide to take it. As the Administrator of the program, there are so many great reports that are at my disposal. One of my favorites breaks down the time taken by employee listing day, how much time and reason. I also love the paper trail that TrackSmart gives the employee and me. When time is requested, we each get an email acknowledging the request and another when the request is granted. It keeps lines of communication very clear. Needless to say, I can’t imagine going back to a pencil and paper system for time off records and I’ve found that TrackSmart is the best system for us. I can’t tell you how much we appreciate real users chiming in! Thanks so much. So glad TrackSmart is working for you.